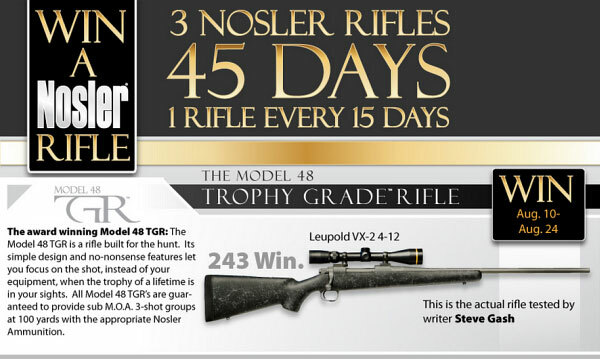 Nosler has announced that they will be giving away three Nosler rifles, starting with a Model 48 Trophy Grade™ Rifle chambered in .243 Winchester. This award-winning rifle will be topped with a Leupold VX-2, 4-12x40mm scope. Retail value of the Model 48 rifle, by itself, is $1995.00. To enter the Nosler Sweepstakes go to the Nosler Facebook Page, and click the “LIKE” icon. Then complete the official entry form by clicking the bright orange “Sweepstakes” tab and providing the required information. Entrants are encouraged to enter daily and to “share” with friends to receive bonus entries. For more details and to sign up, visit Nosler’s Facebook Sweepstakes Page. If you enter the Sweepstakes, Nosler will capture your email address. But when entering the contest, you can “Opt Out”, declining to receive future promotional emails. Also be aware that, when you “Like” a company on Facebook you will, by default, start receiving Facebook updates from that company which may appear in your Facebook Feed. You can block those company updates manually within Facebook, or you could later “un-Like” the company to turn off the updates. Share the post "Nosler 3-Rifle-Giveaway Sweepstakes for Facebook Fans"
This would make a person the envy of the hunt.